Chang’E-3 (CE-3) spacecraft landed on the Eratosthenian basalts in north Mare Imbrium and performed in situ exploration with the Yutu (Jade Rabbit) rover for nearly two months. 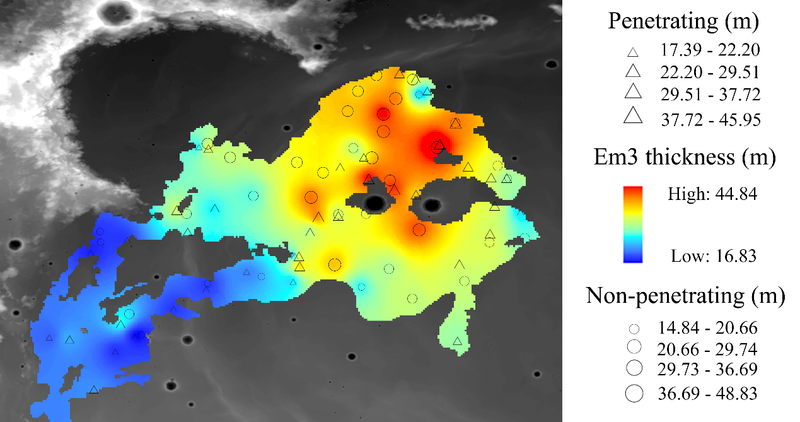 To contribute to the interpretation of the CE-3 rover data, the understanding of the compositional and geologic context of the landing site from a regional point of view is essential. In this paper we performed comprehensive research of the northwest Imbrium through the integrated analysis of diverse datasets. We mapped new geologic and structural maps (Fig. 1) of the research area using a large amount of data including high spatial resolution images (the Lunar Reconnaissance Orbiter Camera (LROC) Narrow Angle Camera (NAC) data), hyperspectral images (M3, the Chang’E-1 IIM Interference Imaging Spectrometer (IIM) data), multi-band images (the LROC Wide Angle Camera (WAC) 7-band mosaic, Clementine, Earth based 70 cm (P-band) radar), topographic data (the LROC WAC low-Sun mosaic data, the Lunar Orbiting Laser Altimeter (LOLA) data), and elemental data. We suggested to divide into the Lower Eratosthenian mare (LEm) and Upper Eratosthenian mare (UEm) units based on whether lava fronts can be clearly seen or not and the age separating the units is 2.35 Ga. The mafic mineralogy of the mare basalts in Imbrium is characterized by abundant olivine in the Eratosthenian-aged basalts and average pyroxene compositions near pigeonite to sub-calcic augite in the Imbrian and Em1 units (Fig. 2). Fig. 1. Geologic map of the northwest Imbrium. Red dashed line marks sub-unit of Em3. We found that the highlands surrounding Imbrium differ from typical Farside Highlands Terrain (FHT). 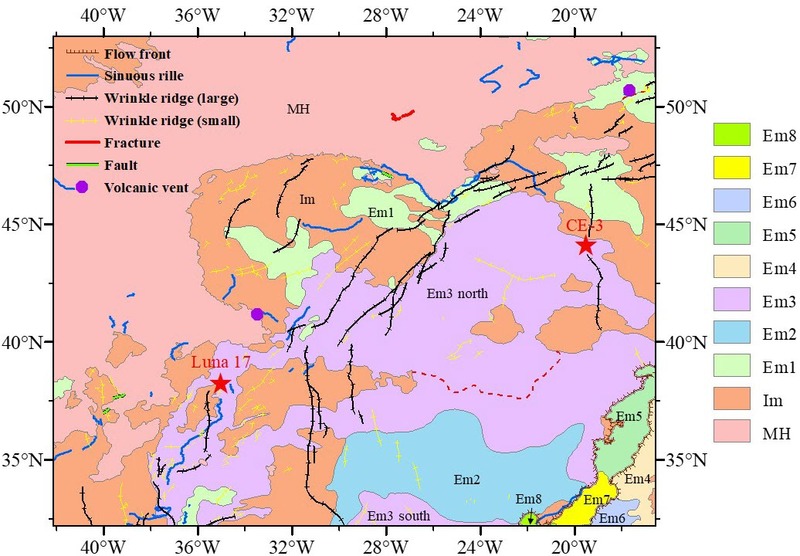 The Iridum highland region (as well as the surrounding Imbrium region) exhibits elevated concentrations of Fe, and abundant local exposures of low-Ca pyroxene and olivine bearing lithologies. In this study these highlands are named as mafic highlands (MH). Our dating results using crater size-frequency distributions (CSFDs) show that the Iridum basin (hosting Sinus Iridum) was formed ~3.8 Ga, shortly following the Imbrium basin formation and before the last large multiringed basin, Orientale. Many young ridges were found inside Imbrium, suggesting a very extended period (<50 Ma) of the Moon’s tectonic activity. Fig. 3. Raster map of the estimated thickness of the Em3 north basalts and the estimated excavation depths of the OPC and ONPC craters. Employing the topographic profile analysis method for UEm and the crater excavation technique for LEm, we studied the thickness and distribution of Eratosthenian basalts in Mare Imbrium. The thickness of the Em3 unit ranges from ~17 m to ~45 m with lesser thickness to the west and greater thickness in the interior and to the east (Fig. 3). The estimated volume and average flux of the Eratosthenian-aged basalts are greater than previously thought. In summary, this paper indicates that the Imbrium basin, including mare and highlands, and perhaps the whole PKT, is an important region for understanding the Moon. This paper was published in Icarus (2018, 303：67-90) as cover illustration. Detailed information of the paper can be found at: https://doi.org/10.1016/j.icarus.2017.12.029.